This is a guest post by Paul Minors, a productivity expert. Follow him on Twitter. My name is Paul and like you I’m really interested in the idea of self-improvement, productivity and achieving more. I currently work a 9am-5pm job and am building my website and business on the side. I’ve spent the last few years building my own successful productivity “system” that allows me to achieve the goals I set for myself and do more. In this article, I’m going to give you the system I’ve developed to help you do more, achieve more, and become more by becoming more productive in just 7 days. Productivity is a superhuman skill. By this I mean productivity is one of the most important skills you can master because when you become more productive, you can improve almost any area of your life. Fundamentally, productivity is a tool for getting more out of life. If there’s something you want to do, someone you want to be or something you want to have, productivity will help you get those things faster. That’s why I encourage you to take action and make a real effort to improve your personal output by blocking out 15-30 minutes each day for the next 7 days and set this time aside for referring back to this post and applying the action steps. Day One: What is Productivity? To kick things off, we’re going to clearly define what productivity actually is. When you know what productivity is (and isn’t) it becomes a lot easier to create a productive lifestyle and optimise your routine. Understanding what productivity is will instantly put you ahead of 95% of people out there who think they’re being productive, but actually have no idea. Effectiveness (goal orientation) – Effectiveness is your ability to make progress towards a goal or outcome. This is why setting goals is so important. A goal lets you measure whether you’re being productive or just active. The person in the example above might be productive if his goal is to sign new clients for his company and he’s just responded to 100 leads. But if the emails have nothing to do with his goals (which is often the case with email), he’s potentially not being as effective as he could be. Effectiveness is all about choosing what to focus on. Efficiency (process orientation) – If effectiveness is doing the right kind of work, efficiency is doing the work the right way i.e. it’s not what you do, it’s how you do it. Or put another way, if you’re on the right path towards your goal, efficiency is how quickly you walk the path. If it took the person in the example a week to respond to his 100 leads, this is less efficient than someone who can respond to 100 leads an hour. Efficiency highlights why setting goals and being effective is crucial to get right first. If you jump straight to efficiency (which a lot of people do) all you’re doing is working on the wrong things quickly – which is a complete waste of time. There are three key pillars of productivity that you need to master if you want to be more effective and efficient; time, energy and attention. 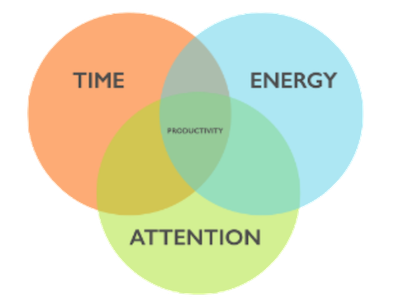 Check out my venn diagram – productivity is the overlap where your time, energy and attention all work together and contribute to more effective and efficient work. You may be good at managing your time and energy but can’t focus your attention, in which case you won’t be productive as you get distracted easily. You may be good at managing your time and attention but don’t have much energy, in which case you won’t be productive as you can’t sustain your effort throughout the day. You may be good at managing your attention and energy, but can’t manage your time, in which case you won’t be productive as you’re not setting aside the time needed to complete a task. Start having a think about your goals and clearly defining what it is you’re trying to achieve. It’s a good idea to break these up between your personal and professional goals. These goals become your yardstick for measuring productivity. We’ll look more at goal setting on day two, for now, just start having a think. Write the above formula on a post-it note and put it somewhere you’ll see it often. Refer to it when you find yourself struggling to hit those targets. Work out which areas you’re failing in and you’ll soon be back on that path of effectiveness and efficiency. Set an alarm on your phone to go off 2-3 times a day. I call this a “Mental Check-In” and have alarms set for 11:00am, 2:30pm and 5:30pm. Whenever the alarm goes off, ask yourself: “Am I being effective, or just active?”. Doing this is going to make you more mindful of what you’re doing and bring you back to the present moment. The objective is to remind yourself to work on the right things i.e. Are you making progress towards your goals, or are you filling time with less important tasks or procrastinating from making that awkward phone call? Keep coming back to this idea of effectiveness and goal orientation. We’re going to be adding to these “Mental Check-Ins” later, but for now, just ask yourself this question regularly throughout the day. Goals define what you’re going to spend your time on. Without this plan, you’re more likely to waste time as you fail to commit to a structured routine. Goals keep you motivated towards your desired outcome. Think about how good it would feel to achieve your dream goals. Goals get you through ‘the dip’. Author Seth Godin describes ‘the dip’ as that moment after the initial excitement of a task has worn off and before you make real progress. Navigating the dip successfully is key to reaching your goals. Goals help you prioritise what to work on and when. When we think about goals, it’s good to have long and short-term goals to work towards. i.e. what are your goals for the next 12, 6 and 3 months? What about this week? What about today? Let’s first look at creating a long-term vision which will help you create your short-term goals. Notice how this goal has very little to do with being more productive. Your goal is your WHY i.e. it’s why you do what you do. Productivity is HOW you achieve this. Once you have a vision for what you want to achieve in the long-run, this can be used to plan and prioritise your monthly, weekly and daily goals. I recommend people set about 2-3 goals per week but feel free to chop and change this as you see fit. A weekly goal could be one simple thing that needs to be done, or it could include smaller tasks that make up your daily tasks. For example, if your weekly goal is to write a blog post, then your daily tasks could be things like: writing the first draft, creating a header image, publishing the post and promoting the post on social media. When deciding what you’re going to do on a weekly and daily basis, don’t try and do too much. You need to budget time for inevitable setbacks and distractions. The other advantage of not over committing like this is that you can set yourself up for success by making sure you can get everything done in the time you have. Generate 10 – 20 leads by Friday. Create 5 concepts for the layout of my website homepage. Write 3 blog posts and 1 guest post this month. Apps like Asana or a simple reminders app on your phone can be extremely useful for planning your days and week. Go through the steps above to define your vision. What is it that you’re trying to achieve? Do you want to start a blog, write a book or build a business? If you don’t have a clear and specific goal written down, it won’t happen. Once you’ve created it, print it out and hang it on your wall. Feel free to write more than one goal; you might have a goal you’re trying to achieve in your professional life, and you may have a completely separate goal for your personal life. Every Sunday from now on, plan 2-3 goals that you’d like to achieve in the following week. Make sure they contribute to your long-term goal. Write these down on a sticky note and put it somewhere visible (you should have a few sticky notes lying around by now). Every day plan the 3-5 tasks that are going to contribute towards your weekly goals. Don’t commit to too much. I recommend using Asana or a smartphone app for doing this but ultimately you should use the tools that you are going to find most useful. You should be planning these 3 – 5 daily goals in advance so in the afternoon each day think about what you’d like to achieve tomorrow (this is a really powerful technique and a great way of giving purpose to your routine). Planning your daily goals in advance is a great time-saving hack that we’ll look at more later. Having goals is great gives you a sense of purpose, creates motivation and helps you decide what to work on next. Often we’re told to challenge ourselves and set the bar really high; this encourages us to set even bigger goals. This is great, until you get hit by the feeling that your goals are unattainable and the whole process of working towards them now seems incredibly daunting. When this happens productivity goes out the window and the idea of quitting can appear more and more attractive. The secret to overcoming this feeling is to take a different approach towards how you treat and tackle a goal. Instead of working towards a due date, work on a schedule. To do this, we must dissect and break down the goal into its individual components. In ‘The 4-Hour Chef’ author and productivity guru Tim Ferriss (also one of my favourite writers) takes you through the process of meta learning – i.e. how to learn new skills extremely quickly. Tim introduces the acronym, DiSSS, which can be used to learn just about anything. The funny thing is that learning something is a bit like having a goal. After all, when you take up a skill your goal is to learn something new right? We can apply DiSSS to goals and break them down into their component parts and schedule them for maximum efficiency. To illustrate how DiSSS applies to goals I’m going to use the example of writing an essay because it’s easy to understand and most people can relate to it. Your essay brief might sound something like this: 4,000 words on productivity due in 2 weeks. For some people, this might sound like a pretty intimidating goal. But when we break it down and schedule the time to complete the essay, it becomes a lot more achievable and far less daunting. Do some research and gather your resources. You’ll then want to do a second draft. And a third and final draft. Each of these seven components are necessary steps that need to be taken to achieve the goal. SELECTION creates a sense of priority amongst the individual components. SEQUENCING – When writing an essay, it makes sense to conduct the research before you start drafting the essay. Then when you start, it’s most logical to write the introduction first before continuing with the body and conclusion. Organising the individual components into the correct sequence will create a workflow which you can then scheduled into a calendar. In this example, the sequence is fairly obvious. But imagine your goal is to create a website, what do you need to do first before anything else? STAKES – Finally you need to set the stakes. Obviously the due date for the essay is a big one. But what about the grade you’d like to achieve? For an extra incentive why not make a bet with a friend and if you don’t reach your target grade you have to undergo some consequence. Creating stakes is where the motivation comes from and it’s what keeps you focused on your end goal. A friend of mine had the goal of moving out within 3 months, so I encouraged him to create some stakes. He decided to start paying his parents rent if he didn’t move out within his target timeframe. Stakes create motivation! Now that the goal has been dissected and the components have been prioritised, everything can be combined into a schedule. This means simply going through the sequence and setting aside blocks of time for each component. Working backwards from the due date is a good start. In this example you may want to have the essay done at least two days before it’s due, working backwards from here you might allow 2 hours for the final re-draft on one day, an hour for each paragraph on previous days and 4 hours for research at the beginning (and so on). Once you get everything into a schedule it’s amazing how much stress goes away. This is because you can clearly see how much time has been budgeted for the goal and the necessary steps are now scheduled in the correct order. Putting this plan in place boosts your productivity as you spend less time working out what to do next and more time doing the work. Take your long-term goal from day twos exercise. On a piece of paper jot down all the steps you can think of that will help you towards your goal. Highlight the above steps which you absolutely need to complete. Which steps could you potentially skip? Which steps are going to contribute the most progress towards you reaching your goal? Which steps eliminate the need for others or contribute to others being completed (i.e. the lead domino). Add some stakes to the process. When do you want to have goal completed by? What will do you if you fail (think about consequences)? Tell other people and make sure they hold you accountable. David Allan, productivity expert and author of “Getting Things Done”, outlines the necessity to get tasks and goals out of your head and into a trusted system. This system needs to trigger information to be recalled at the right time and place. This is exactly what we’re going to work on today; building a system that’s going to capture and hold all your to-dos and commitments. TODAY – These are all the tasks you want to complete today. NEXT ACTIONS – Next actions are the smaller tasks that aren’t tied to a particular due date. They are the things that you’d like to do when you get a chance. WAITING – When you’re waiting for something to happen or someone to respond before you can complete a task, the task can be marked as “Waiting”. This section is useful as it separates the actionable tasks that you need to work on from the tasks that you’re waiting on. THIS WEEK – These are the tasks you plan on addressing in the current week. For me, my week ends on Sunday, so anything I plan on doing on or before Sunday goes into this section. This section basically forms your weekly goals and gives you a view of everything you hope to achieve in the upcoming week. NEXT WEEK – These are the tasks you plan on doing next week. It’s good to have these grouped together so that you can think ahead about what’s coming up in the near future. It’s also handy when you think of new tasks to quickly move things to your next week section if you want to come back to them later. Find a to-do list manager that works for you and use it to plan your days. I strongly recommend Asana as it allows you to create this workflow and set due dates so that tasks move through the system seamlessly. Ultimately it’s more important to find a tool or system that works for you. The tasks in you to-do lists should correspond to a block of time on your calendar. Even small 15-30 minute tasks get a block of time. Planning your day like this has a number of benefits. Firstly, it lowers your stress as you can clearly see that important tasks have been given a time slot. No more: “oh, I have to remember to do X and Y” as you’ve allocated time to come back to it later. Your calendar moves from being a tool for organising meetings and remembering key dates to a tool for planning your time. This is beneficial as means you don’t waste energy working out what to do next (more on this “decision fatigue” in tomorrow’s lesson). Instead you can move from one task to another with minimal switching costs i.e. the cost of refocusing your mind and working out what to do. Putting something in your calendar is like making a promise to yourself that you’ll do something. This makes you more likely to complete the task later. With these promises in place your calendar creates a filter for managing distractions. For example, when someone distracts you, or you feel tempted to divert from your schedule, you can refer back to your daily calendar to remind yourself of what’s important. Or if someone tries to schedule a meeting when you’ve planned to do some work, you can politely say: “Sorry, I already have a commitment at that time, how about X”. 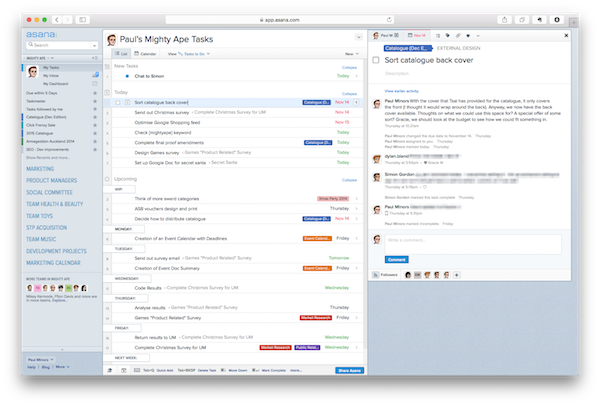 Work out what you’re going to use as your to-do list manager and set up the above workflow. I recommend Asana. Start planning your weekly (2-3) and daily goals (3-5). Add these to your to-do list. Check out my blog post and learn how individuals can get started with Asana. Add items from your to-do list to your calendar (yes, everything and include personal goals and events). Use recurring events to automate your calendar. About 70-80% of my calendar each week is already completed as events like work, breaks, planning time, gym etc… all repeat. Leave enough space between events to allow for distractions or urgent work during your day. Energy is a massive topic and there are lots of things you can do to increase your energy. We’re going to focus on three key areas: sleep, exercise and diet. Unfortunately in this course we can only touch on these areas very briefly, but we’ll cover some quick-wins that are easy to implement and guaranteed to improve the quality of your energy. There’s no magic button you can press to increase your energy. By making lots of small changes and adopting new habits, you can take the steps towards necessary to increase your energy levels. Each of the steps below will add up and work together to create a much more productive, healthy and enjoyable lifestyle. Sleep is often the first thing that gets sacrificed when people are busy. They think by sleeping less and working more they’ll be more productive. This is a big ‘NO’. Sleep deprivation makes you slower, less creative, more stressed and generally under-perform. On the flip side, high quality sleep improves your immune system, balances your hormones, boosts your metabolism, increases your energy and improves brain function. A study published in The Lancet proved that sleep deprived individuals take on average 14% longer to complete tasks and make 20% more mistakes. This definitely isn’t productive. There are lots of recommendations around how much sleep is necessary. Ultimately it comes down to what works for the individual. I aim for 7.5 hours in total each night which is exactly 5 sleep cycles (90 min each). By waking up at the right time i.e. at the top of a sleep cycle, you wake up feeling more refreshed and ready for the day. You should also ensure you are sleeping between the hours of 10pm and 2am. as studies have shown that restoration and hormones secretion is most effective during this time. This means that even if you get the same amount of sleep but miss this window, you’re more likely to wake up feeling sluggish in the morning. Finally, don’t keep your body up into the early hours of the morning and think you can “catch up” later. Your sleep needs to be consistent if you want to get the most benefit. I aim to sleep from 9:30pm – 5:00am window. This means I can get up at 5am and do an hour of quality undisturbed work the next day before hitting the gym. This 5:00am – 6:00am window is one of my favourite times of the day to work and certainly the most productive. I strongly recommend you give it a try. There’s no arguing with the fact that exercise is crucial for a healthy lifestyle and boosting your energy. Scheduling a workout for the morning can be a great way of starting the day and setting your body up for success. Cortisol (the energy giving hormone) is highest in the morning to encourage activity and exercise. Studies show that morning exercise is more beneficial for your sleep and energy levels compared to working out in the afternoon or evening. Working out may not seem like it has a direct impact on productivity. But by looking after your body and keeping healthy you’ll take fewer sick days, maximise your energy and improve your focus and attention. Make sure you get regular exercise during the week and you’ll very quickly start to realise the benefits this has on productivity. In terms of how much exercise you should be getting, I like to aim for 4 workouts a week that contain a mix of cardio and resistance work. If you can’t commit to this don’t worry, something is better than nothing. A final piece of advice I like to recommend is to go for a 10 to 15 minute walk during the day. Going for a walk is a great way of getting oxygen to the brain, clearing your mind, de-stressing you and it gives you time to reflect and plan your next move. Schedule time for your walks in your calendar. Consuming a quality diet is another essential element necessary for maximising your energy. Breakfast in particular is arguably the most important meal of the day and yet so many people are skipping this meal as they run out of time in the mornings. This is one of the worst things you can do in terms of productivity as your body is literally in starvation mode having not eaten for 10 or so hours. By depriving your body of energy you’re reducing your body’s ability to focus and depleting crucial brain power. If you’re guilty of skipping breakfast this has to stop NOW! Making a quality breakfast like scrambled eggs on toast can literally take less than 4 minutes in the microwave. There really is no excuse for missing this meal. Focus on whole foods in the morning i.e. natural ingredients, not processed food and stay clear of sugar and cereals. Scrambled eggs on whole grain toast is a great breakfast and the perfect recovery meal after a morning workout. Protein shakes or oats with a banana are also great ways of setting yourself up for the day. Throughout the day be sure to avoid sugary processed foods whenever you can. These sugary treats give you a short-term buzz and you might think they help you “get through” the afternoon. But it’s much more sustainable to consume a slow releasing and quality source of energy like fat. The action steps below, while small small, can add up to big improvements in your energy levels and productivity. Remember, there’s no magic button you can switch on to increase your energy. But lots of little changes can work together and add up to better productivity. Stick to a consistent and routine sleep schedule. I recommend 9:30pm to 5:00am or 10:30pm to 6:00am. The benefit of getting up early is that you can then get an hour or so of quality undisturbed work in when you’re brain is fresh. Check out my blog post “5 Reasons Why Getting Up Early is Hyper-Productive” for more information on this. Introduce some form of regular exercise into your schedule and aim for a minimum of 4 workouts a week. It doesn’t matter too much what you do. Whether you like to walk, run, swim, lift weights or climb, as long as you’re keeping active you’re going to start noticing an improvement in your energy levels. Set yourself up for the day with a quality breakfast. Try scrambled eggs on wholegrain toast or a smoothie. Here’s a simple recipe you can try. Make sure you’re staying hydrated throughout the day. Often a lack of energy and focus can be directly attributed to dehydration. Keep a bottle of water with you throughout your workday. Implement a caffeine curfew and make sure you’re not having tea, coffee or other energy drinks right before bed. Caffeine stays in your system for a very long time and even a cup of coffee at 3pm can impact on your sleep later on. Have you ever had one of those days when you have a to-do list of jobs you’d like to complete only to find 5pm rolling around and you’ve barely touched the first one? Distractions can ruin productivity as can our own brain and its natural tendency to wander off. Today we’ll look at tactics for managing with distractions and focusing your attention. In order to focus your attention, we’re going to look at three key areas: decision fatigue, email and meditation. Every time you have to make a decision, whether it’s deciding what to work on, what to eat or what to wear, you give up some of your mental energy – focus and creativity in particular are sacrificed. As you continue with your day, your willpower decreases as this mental energy decreases; this is why you often find you get a lot more done in the mornings. People like Steve Jobs, Barrack Obama and Albert Einstein like to wear the same thing every day to combat this. While I think this is a little extreme, you have to respect their commitment to optimizing mental power. Make sure you have your #1 goal for the day worked out the night before. Don’t spend the first 10 minutes of your day planning what to do. Remember what we said a few days ago – leave time for planning each afternoon to decide what you’re next day is going to look like. You can then get up early and start working on your #1 goal before anything else, while your brain power is at its greatest. Leave any “autopilot” tasks for the afternoon so that you’re not wasting brainpower on tasks that doesn’t require it. You’ll now see the beauty of having a complete calendar is that it eliminates the need to ask yourself: “what should I work on next?” as you’ve already planned your time based on your priorities. You move from one task to the other very quickly and without contributing to decision fatigue. By lowering decision fatigue, you can focus for longer throughout the day and reduce task-switching which takes up valuable time. You’ll also find yourself getting less distracted as your strengthened willpower keeps you on task. So many of us spend ages going through emails, replying to each and every one and wasting hours of otherwise productive time. Remember, email is everyone else’s agenda for your time and you shouldn’t let email run your day. Chances are the emails you’re replying to aren’t contributing to your goals and yet this is where so many of us spend the majority of our working days. It’s time to take a different approach to email. First off, don’t sort or reply to your email before 10am. Focus on your most important goal first thing each day. Your email can wait and even is someone needs you urgently, they can alway call or come and see you if they need to. If you need to, scan your Inbox for anything that’s urgent or related to your goals, otherwise it can wait until you’re ready. Better yet, schedule time in your day for email and try holding yourself to it. You’ll be amazed out how much time gets freed up when you start doing this. Batch your replies to these dedicated time slots 2 or 3 times a day and see what it does to your productivity. Keep your Inbox organised and free of clutter. The simplest way to do this is to “Archive” a message or conversation once it’s complete. This leaves only the emails that need to be actioned on. When you reach a moment in your schedule to address your email, you can quickly scan this list of outstanding emails to determine what needs to be replied to or actioned upon – If so add it to the corresponding day or the “Next Week” section in your to-do list. You’ll come back to this later. Meditation isn’t just one of those “oh – that sounds nice” kind of tips. Meditation improves your focus and attention like nothing else can. Did you know that your brain physically changes shape after practicing meditation as you learn to control your attention and focus. Meditation calms your mind and reduces the amount of noise your brain has to deal with. Benefits can be realised after just 5-10 minutes of meditation a day. i.e. very little time invested for huge gains in productivity and well-being. Meditation increases the “feel-good” hormones and endorphins in your body and lowers stress hormones like cortisol. Meditation gives you better control over your “alpha rhythms” which are thought to reduce the likelihood of stimuli grabbing your attention i.e. you don’t get as distracted as you used to. This means, better focus. Studies show those trained in meditation stay focused on tasks longer (lower switching costs) and maintained higher levels of focus and self-control. Meditation can improve your stress, creativity, anxiety, focus and relationships. I’ve been meditating for the last few months and WOW! I’ve noticed drastic improvements in my focus, I feel calmer, less stressed and more content each day. I highly recommend you get started with meditation which will improve your productivity and contribute to a healthy and balanced lifestyle. Getting started is super easy using the Headspace app. Headspace is a gym membership for your brain and is probably the most popular meditation app around. It takes a scientific approach to meditation. Headspace starts with Take 10 which eases you into meditation with 10 minutes a day for 10 days. Learn more about the benefits of meditation and the science that backs it up at www.headspace.com/science. Systematize your morning routine. Work out what the first hour of your day looks like and stick to a consistent morning routine. Write it down. What are the steps to completing your unique morning routine? Continue from previous emails and make sure you are planning your daily goals the afternoon before. This will help lower decision fatigue throughout the day. 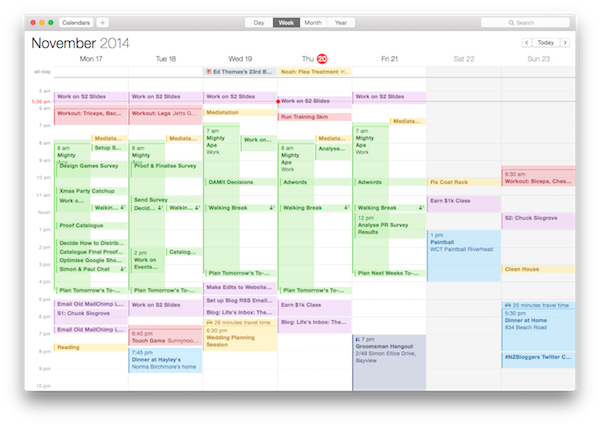 Schedule time in your calendar for dealing with email and hold yourself to it. If you’re finding it tough start with 5 sessions a day then progress to 3 or even 2. Download Headspace and start Take 10. There’s no excuse for not investing 10 minutes a day to meditate. You can thank me later for how good this will make you feel! As you progress with Headspace, start using your “Mental Check-Ins” from my earlier email to be more present. Take 30 seconds to take notice of how you’re feeling and be in the moment. The Headspace app will guide you through this as you progress. When you refer to the table below, remember that this is just a guide. Your routine is going to be specific to you and the time you allocate to goals may be longer or shorter than what’s shown here. But this should give you a good foundation from which you can build and customise your own productive routine. On a Friday or Sunday afternoon, review everything in the “Next Week” section of your task management app and schedule time to complete these tasks during the upcoming week. You’ll often find that the main goals for each day will be worked out during this time, so during your end of day planning process you may simply review your calendar as you’ve already decided what you’re going to be working on each day. During this planning time, clearly define your goals for the following week and the smaller action steps you’ll need to complete to reach them. If you like working on side-projects like me, spend a few minutes on Sunday afternoon planning what you’d like to achieve in your free time. Plan when are you going to work on your personal goals. An ideal time would be 5:00 – 6:00am. You may also wish to spend a few hours in the evening working on these side-projects. Plan this all out on Sunday, add your personal goals to your to-do list and schedule the necessary blocks of time in your calendar. It’s a good idea to review your goals about once every three months. Set this up in your calendar to repeat every quarter and take this time to review and plan your goals. Have a look at the vision you created earlier and tweak if necessary. Ask yourself if you are on track to meet your goals. Reviewing your goals every quarter like this is a lot more effective than doing it once a year like a lot of people do. By reviewing your productivity every 90 days you can make changes quicker than if you were only doing this once a year. Have a go at mapping your own daily routine. Schedule key goals and recurring events on your calendar. e.g. going to the gym, time to plan. Schedule a quarterly review in your calendar to make time for evaluating how you’re progressing towards achieving your vision. Please don’t hesitate to get in touch if you’d like help customising your routine. Simply hit reply and flick me an email. This simple 7 day program will help you dramatically increase your productivity. 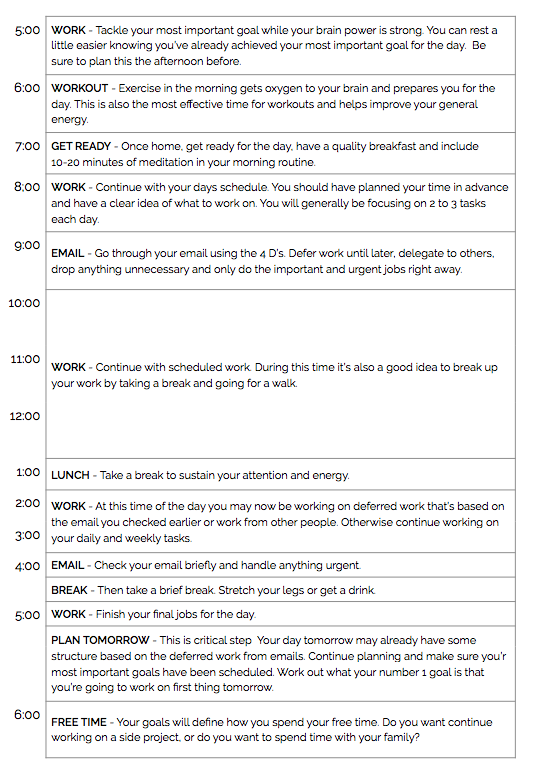 I hope you found this 7 day productivity plan useful. Let me know in the comments below your biggest takeaway from today’s lesson. I’d love to hear from you! Hey guys, great stuff here, thx! This is one awesome gift you’re giving to all of Blogville. How much would others try to charge for all this wisdom? Thank you. Thanks for the great feedback guys, glad you enjoyed the article!